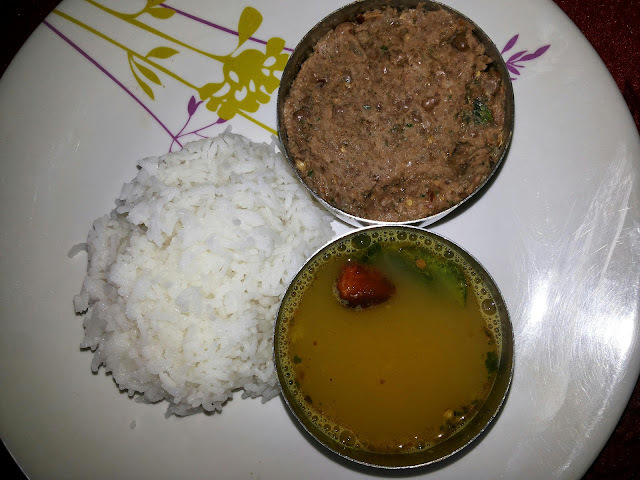 Kollu paruppu or Horse gram contains high protein resources more than other dals. It is having medicinal value to cure kidney stones, menstruous problems. It is a weight reducer and cholesterol free. contains antioxidants. Horsegram one cup onions peeled off and chopped one cup Red chillies 4 curry leaves one cup coriander seeds 1 tablespoon cumin seeds one spoon Cooking oil one tablespoon Salt required. Cook horse gram in a pressure cooker. Heat oil in a pan and saute red chillies, onions, coriander seeds , cumin seeds and curry leaves combined together in oil. Allow the ingredients to cool. Allow the cooked horse gram to cool. Drain the water from cooked horse gram completely. Grind the roasted ingredients with one portion of cooked horse gram coarsely. Take and Mix half portion of a ground mixture in drained water in a separate vessel. Add the remaining cooked horse gram into the jar and grind with required salt. Thuvaiyal is ready.